This report is for those who would like to observe God’s Holidays. This has absolutely nothing to do with the Law; this has everything to do with the Holidays God has given us to be observed. It is not complete, and if I tried to make it complete it would be more than most would want to read. So I do hope it wets your appetite. The Hebrew word Rosh means “head” or “Beginning” Ha means “the” and Shannah means “year”. It’s only used once in the Tenach “Old Testament” Ezekiel 40:1 says, “in the beginning of the year” in the Hebrew it says Rosh Ha Shannah. The more common Biblical name is “Feast of Trumpets.” Lev.23:23-25 And the Lord spake unto Moses, saying, In the seventh month in the first day of the month, shall ye have a sabbath, a memorial of blowing of trumpets, a holy convocation. Ye shall do no servile work therein: but ye shall offer an offering made by fire unto the Lord. Rosh Hashannah is considered the Jewish New Year, but it comes on the seventh month on the first day. In the Jewish world it is considered the birthday of the world. If you count from the first day of Elul (the 6th month) until the 1st day of Tishri (7th month) which is Rosh Ha Shannah you will have counted 30 days. Known as the 30 days of preparation ending with Yom Teruah, Yom in Hebrew is “day” Teruah means “Trumpets” so it’s the day of sounding the trumpets, or known today as Rosh Ha Shannah. If I haven’t lost you yet, you are doing well, don’t let this get to complicated, because it will come to you in time. Now lets go on…. Rosh Hashannah is the Spiritual New Year, not the regular new year, for it would come on the first day of Nisan, the first month on the Jewish calendar. Much like the 6 days of creation, the 7th day is the Sabbath. The same is true with the first 6 months and the 7th month being a Sabbath, and the 1st day of the 7th month is Rosh Ha Shannah, the spiritual New Year. Recognized in Israel and the Jewish world as the New Year. It’s interesting living in Israel during these ten days of repentance, everyone you know will most likely call you and make sure everything is all right with you and them. They will ask you to forgive them for anything they may have done during the year that may have offended you. There seems to be more nice people in Israel during these ten days. 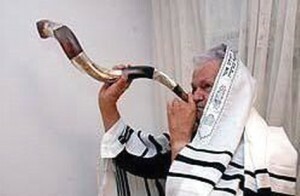 In the Synagogue the Shofar (Trumpet) is blown daily to be sure that everyone knows that the time of Judgement is near. Most of the orthodox will take a water immersion called in Hebrew (tevilah mikveh) better known to you as baptism. It means that one has cleansed his ways. Or been separated unto a Priestly Ministry. This is what John the Baptist was calling the Jews to do, but with a Messianic meaning. Because of the meaning of repentance this day takes on a somber character, but with a hint of hope of God’s forgiveness there is room for a festive meal. It is the custom to serve a fish cooked with its head. Placed in front of the father. It shows that he has been ordained by God to be the head of the family. It is also a time to test the first fruits of the new harvest. Find a fruit that gets ripe in your region and do not eat any until this meal. Make it an occasion for the family, they will enjoy it much more than if they have eaten it earlier. Make the meal even more interesting by blowing a shofar, or trumpet, you don’t have to be a professional to do this. In the Synagogue there are four different notes blown, tekia (blast) shevarim (broken notes), teruah (alarm) and tekia gedolah (the big blast). In Biblical times the Shofar was blown to Hail the King, on this day it’s said that all Israel is said to be before the King in anticipation of personal judgement. It’s customary for slices of apple to be dipped into honey, this is in hope that the coming new year will be a sweet one. After dipping the apple in honey, the Father says a special prayer. Instead of the regular twisted loaves of bread, the challah, for this meal you have round bread, symbolic of our desire for a full and round year. If you bake your own bread, save a little dough and form a small latter on the top of the loaf. Showing that your prayers are for God Who sets on high, that when we pray we are not just talking to each other, but to God through the Person of Yeshua our Messiah. When the meal is over and the grace has been said, (the Jewish way and biblical way is to say grace after you’ve eaten) then read the story of Abraham and Isaac Gen. 22:1-14. Talk about God’s provision of a ram to be sacrificed in Isaac’s place. A living picture of what was to come in His greater gift to us “Yeshua” Jesus. Tashlich, on the afternoon of Rosh Ha Shannah it is traditional to go to a river or a body of water. This Hebrew word Tashlich means “thou shalt cast unto the sea”. Bring your kids to the lake, river, sea, or any body of water. Make sure they wear cloths with plenty of pockets, and fill them with pebbles or small stones. Throw the rocks into the water each time designate each rock with a sin. Each time asking God to forgive you of that sin in your life. Micah 7:19 and thou shalt cast all their sins into the depths of the sea. And see how far you can throw each stone Ps. 103:12 As far as the east is from the west, so far hath he removed our transgressions from us. It almost always happens that a child will find a very pretty stone that they want to keep, and it will give you a wonderful opportunity to talk about the sins we seem to like, but must cast off as well. It is a great family experience. For the child it opens the door for the Holy Spirit to do a work. Much like when you introduce another to Yeshua and open the door for the Holy Spirit (Rauch Ha Kodesh) to do a work in their life. There are many special foods for this day, and I could go on and on, but I will close this article with this. The Holidays that God has given us are real and pure, not pagan like so many celebrated in the Church today, like Christmas, Easter, Good Friday etc, etc. Try this one, you will love it, your kids will be brought closer to God because you did.